It doesn’t matter how long you’ve been in business. Staffing, logistics and general daily activities can be overwhelming. It makes you think “I don’t have time for marketing.” The truth is, marketing is an imperative component that helps your business stay afloat. Keeping up with marketing trends and best practices helps stand out from competition, winning you more business. We’ve compiled 8 tips to make marketing your local business more manageable, and many of these tools are already at your disposable. And if you’re interested in more tips, our blog about Restaurant Marketing Ideas can be found here! Don’t first name greetings at your neighborhood salon, spa, or gym make you feel all warm and fuzzy? 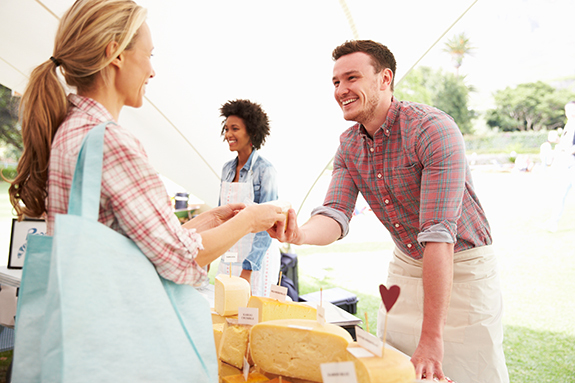 Small businesses are more personal in nature, allowing for better quality and customer service. It’s no surprise 91% of consumers shop at local businesses because of they way they’re treated. The personal touch pays off, so take advantage of being local and having a closer clientele. Learn names, start conversations, write handwritten thank-you notes, and offer special deals. If your business is not on Instagram, you’re missing out on a free – and powerful – social marketing tool. Getting started is simple. Make a recognizable and relevant username, then start snapping away with your smartphone. Feel free to share the password with trusted staff members (especially those who have an eye for excellent photography and user generated content). Post your Instagram handle (or name) in your business and let visitors know you will be sharing exclusive sales and promotions. This will encourage customers to follow and tag you in posts. You can even run contests for customers who promote hashtags of your choosing. Fun hashtags like #KeepYourBodyInTune or #HotHair can help drive off-peak traffic. Finally, send direct messages containing special offers to Instagram celebrities. Be sure to entice them to post a photo from within your business or with one of your branded products. How can you find said Instagram superstars? Search localized hashtags , like #sfdogwalker or #pureyoganyc, and look for users with large followings, like this silly pup. If consumers aren’t immediately turning to Yelp to search a local business, they will. Google has bowed to this user-generated content king, so they’re definitely worth taking notice. Yelp is one of the highest-ranking sites in the entire country out of 430,000 according to Alexa. This means Yelp gets more traffic than consumer-focused giants like Buzzfeed, Disney and Macy’s. 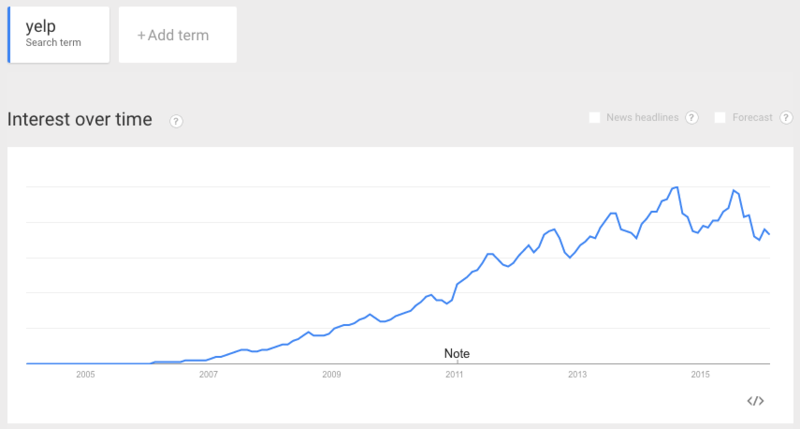 The volume of searches including the word “Yelp” have continued to trend up since 2006. Step one: claim and update your free business account. Post photos, edit hours and basic info, and set up weekly email alerts to track user activity. Never, ever incentivize your customers to post reviews. And don’t try to post reviews yourself. Yelp is sure to make this a waste of your time and energy. Yelp’s algorithm often removes rave reviews from users with no prior activity. Take negative reviews as constructive criticism, looking for areas of improvement. Thank reviewers for their feedback and invite them to come back to fix the wrongs. If you go out of your way to provide an exceptional experience, the customer is likely to take note. Turn a squeaky wheel into a life-time client. Use Yelp check-in offers to entice customers to visit you rather than the competition. Check-in offers are a free feature, available to anyone with a Yelp business account. Offer discounts to first time visitors to your business. Give a free class to a customer who checks-in to a gym class 4 times next month. Providing a little extra love will never hurt your chances of a positive review. Chances are pretty high that you have never heard of Google+ (or “Google plus”). Chances are also pretty high that your customers haven’t, either – but that they have likely used it to find you. Immediate, local searches (often referred to as “nearby search”) are becoming increasingly popular. In fact, they’ve increased 34x in the past few years. Google saw this trend and conquered, improving the way search results are displayed in the local “3-pack” and giving users a great search experience with local options, location & map view, reviews, hours and links to list of services. The good news? Your local Google business listing is another free tool you should take advantage of. The better news? We break down how to claim your free G+ listing in our free eguide. These are the last social media and/or listing sites I’m going to write about, I promise! But it includes another free tool tip, so listen up. Facebook has 1.44 billion users worldwide, with 70% of American adult users visiting daily. Twitter has 302 million users, and although small(er), still mighty. You’re busy running your business – who has time to tweet? You do, if you are smart about it. SinglePlatform posts announcements, specials, and events immediately or schedules them on a recurring basis. Singleplatform can also publish your menus on listings like Yelp and Google. So no matter where customers are finding you, they can find your specials, too. Don’t forget about photos! Studies shows that photos on Facebook drive 120% more engagement. And tweets that include photos get more retweets and favorites. Here’s the last free tool in this section: Facebook and Twitter each have their own reporting built into their business pages. Check out your Facebook Insights and Twitter Analytics each month to see which posts are getting the most love. You will start to learn what works for your audience so you consistently improve your strategy. It is actually pretty easy. Even if you do this digitally, you don’t need to sink tons of money into a custom app to rival the big guys. One-size-fits-all options like LevelUp allow users to pay on their phones and be rewarded for spending regularly with your business, and are easily integrated into your regular system. Serving mostly old school customers? No problem. Punch cards are still an affordable and effective option if you’ve got a grab-and-go concept or referral promotion. Collect email addresses by incentivizing customers with a coupon or to be entered into a drawing. Bonus: asking for written feedback is a free way to help avoid negative online reviews! Your customers are awesome. What’s the best way to get more like-minded, awesome people through the door? Incentivize regulars to bring in friends with a referral program! If you’re a gym or yoga studio, offer visitors free guest passes for classes. If you’re a salon or spa, reward repeat clientele discounted services for referrals. Rome wasn’t build in a day, and neither was anyone’s marketing expertise. Your first post or reward program may not be an instant hit. Keep experimenting to see what works best for your audience. After all, social media marketing is a muscle! And listen to your customers to learn what information they want, and how they want to receive it. As always, please don’t forget we are here to help improve your online presence, post your specials everywhere that matters, and engage with your customers. (Shameless Plug).